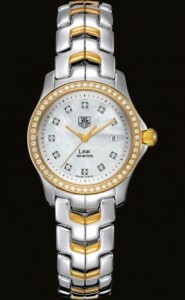 The WJF1354.BB0581 TAG Heuer Link Quartz Women’s Watch is a refined and classy watch made for the sophisticated modern woman. The most prominent features of the TAG Heuer Link Quartz are found on the dial and bezel. The dial is made from mother-of-pearl and have 11 Top Wesselton diamonds that are used as the hour markers (the exception being 3 o’clock, which features a date window). The bezel is equally fancy: it’s made out of solid gold and is set with 52 Top Wesselton diamonds. The watch’s bracelet complements the bezel nicely, featuring an S-link design made from polished gold plate and satin steel. While the combination of 63 diamonds and gold seems to give the watch an overpowering presence, the Link Quartz maintains a level of urbane understatement that lets it be noticed, but not noticed first. Other note-worthy features on the Link Quartz are the solid gold plated steel crown and the case machined in a solid block of stainless steel. It features a convex, scratch-resistant sapphire crystal and is water resistant to 200 meters. The watch also has a high quality Swiss quartz movement. The TAG Heuer Link Quartz women’s watch is an excellent watch for an elegant night out and is sure to accent a woman’s finest jewelry.